Konig Glacier is a land terminating glacier just north of the Neumayer Glacier, ending on an outwash plain in the Antarctic Bay (AB) on the northwest coast of South Georgia. In 1977 the glacier extended to within 300 m of Antarcic Bay and no proglacial lake existed (BAS map). Neumayer Glacier is a calving glacier that has retreated 4800 m from 1999 to 2014 and is dynamically connected to the Konig Glacier along its southern margin just where the glacier turns northeast. Gordon et al., (2008) observed that larger tidewater and sea-calving valley and outlet glaciers generally remained in relatively advanced positions until the 1980s. After 1980 most glaciers receded; some of these retreats have been dramatic and a number of small mountain glaciers will soon disappear. 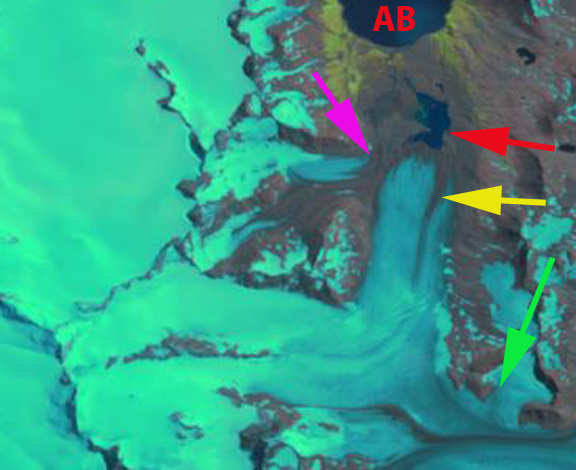 Here we examine changes in Konig Glacier from 1999 to 2014 using Landsat imagery. 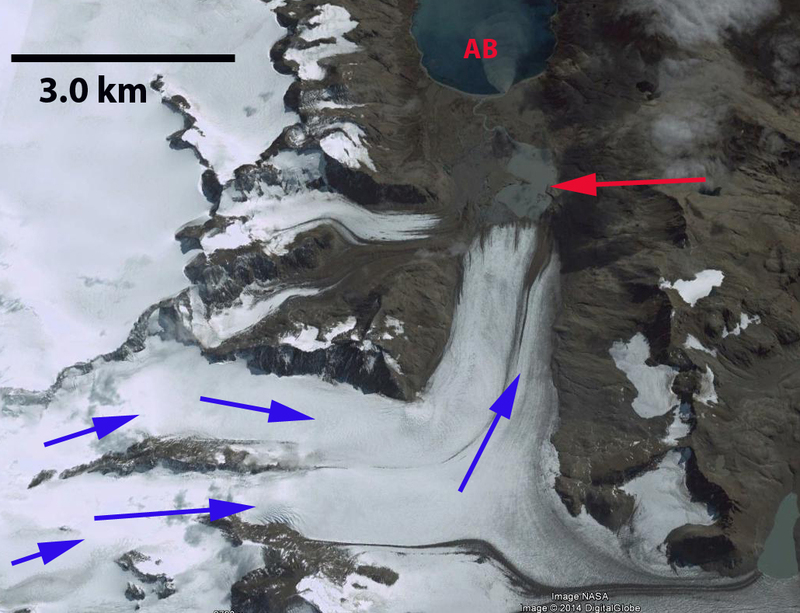 In 1999 the glacier ended in a proglacial lake at the red arrow, where a terminal moraine developed across the lake. 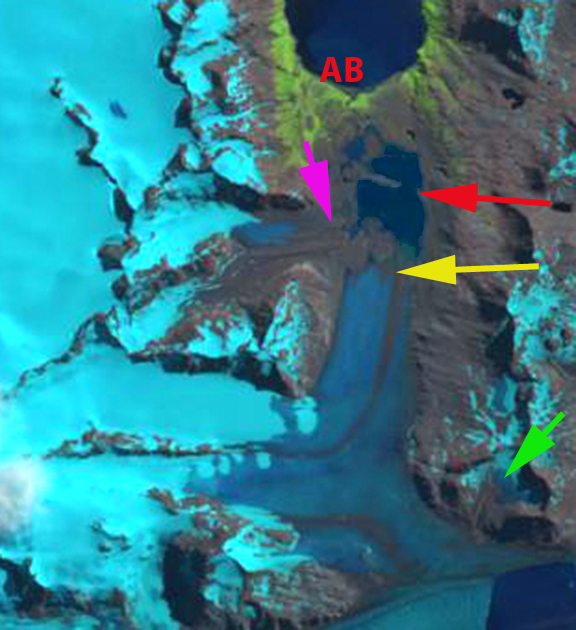 A tributary glacier from the west joins the Konig Glacier near the terminus in 1999, pink arrow. At the green arrow is a small cirque-valley glacier that joins the Neumayer Glacier near the boundary with Konig Glacier. 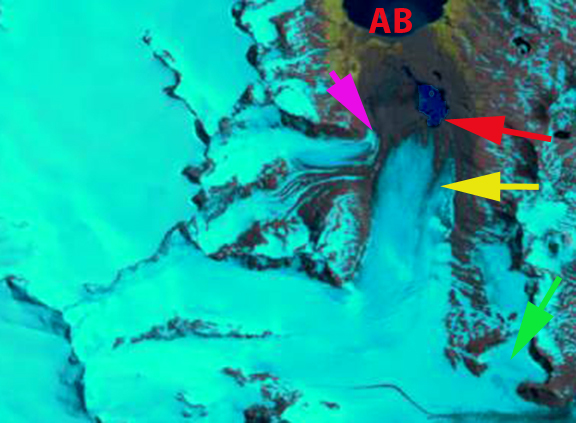 In 2003 there has been limited retreat of the main terminus since 1999 and of the west tributary at the pink arrow, the British Antarctic Survey mapping shows that the two glacier had separated by 2003. The side cirque glacier at the green arrow is still connected. By 2005 a closeup of the terminus in Google earth indicates the low slope, lack of crevasses and developing outwash plain at the terminus. The terminal moraine in the middle of the lake marking the 1993 terminus position is also evident (BAS). The retreat from this moraine by 2005 is 500m. 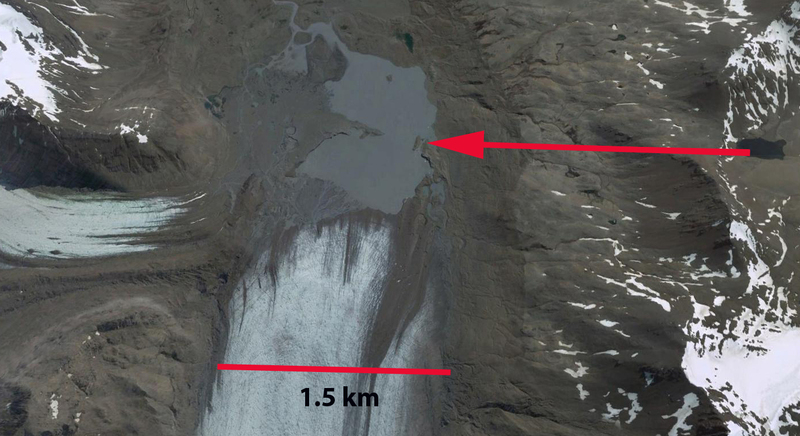 In 2014 the glacier has retreated from to the yellow arrow, this is an 800 m retreat in 15 years from the 1999 red arrow terminus. The proglacial lake is now 1500 m across and the terminus is 2300 m from Antarctic Bay. The west gtributary at the pink arrow is fully separated. The side cirque glacier at the green arrow no longer is connected to the Konig-Neumayer Glacier. This indicates considerable thinning of the junction of these two glaciers which will result in further retreat of Konig Glacier. This entry was posted in Glacier Observations and tagged konig glacier retreat, konig glacier thinning, neumayer glacier retreat, porglacial lake expansion south georgia, south georgia glacier retreat. Bookmark the permalink.